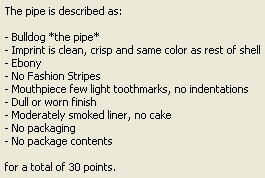 The value of pipe #751 is 30 points. It was a pleasure to meet Larry Voorhees (pipedude) at the 2008 Chicago Pipe Show. It was a greater pleasure when he presented me with this very nice black Bulldog. I already have a NIB exemplar so this one goes directly to the Pipes for Sale or Trade page. Steve LaPlante bought this one for his dad.